How To Map IP Ranges To Their Organization? For cybersecurity analyst to discover any impending threats, the starting point is usually by checking the attacker’s infrastructure. Whois records provides the essential base for most investigations. But attackers can easily stay hidden with domain Whois protection services thereby preventing the analyst from accessing the much-needed Registrant information. In such a scenario analyst can circumvent their research by finding the IP address of the attacker. IP data can offer analysts with various touch points of these bad actors. Understanding the importance of IP data for threat intelligence, WhoisXmlApi has already been providing various IP products and services like domain IP database, IP Geolocation, Reverse IP, covering 99.5% IP addresses in use now. Taking that a step further, we are now excited about our latest endeavor in the IP space with IP Netblocks Whois Datafeeds! This database will equip you with all the information with regards to all the currently registered IP blocks (ranges) with details of the ISP or hosting provider that uses that block for its customers. With all this data, you not only know which organization that IP range belongs to but also have location & contact details for the ranges. In order to provide an even more holistic view, our database has data from all the five existing RIR’s. Generally speaking, IP addresses are assigned in a hierarchical manner. Users are assigned IP addresses by Internet Service Providers (ISPs). 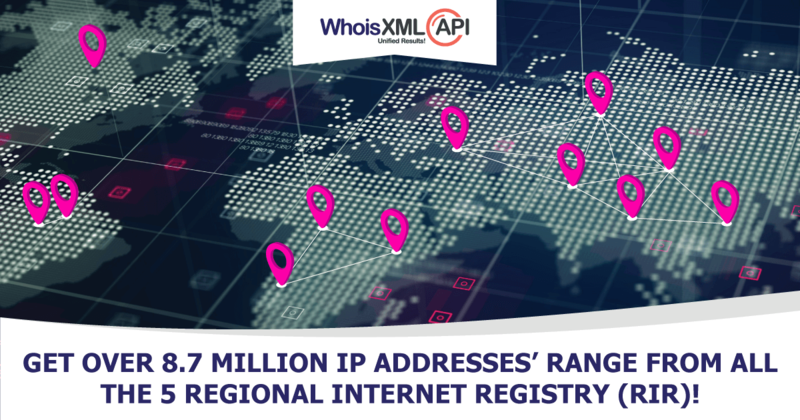 ISPs obtain allocations of IP addresses from a Local Internet Registry (LIR) or National Internet Registry (NIR), or from their fitting Regional Internet Registry (RIR). 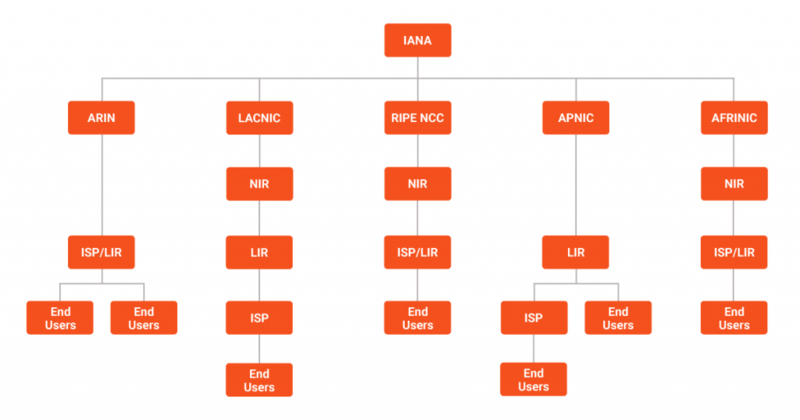 At present, there are 5 RIRs namely; AFRINIC, APNIC, ARIN, LACNIC, RIPE NCC, who are responsible for all the IP address allocation. Our data is gathered from each of these 5 sources so as to provide all the information together and save your researchers time. Our Current database provides all the information of the IP Netblocks for a given date. In case you would like to know the changes in the IP Netblocks database compared to the previous date you can also get Today’s database which includes added, dropped and modified IP ranges. At present, our database has over 8.7 million IP addresses’ range with detailed information & contact points for each range. By getting the most real-time, accurate and comprehensive IP Netblocks, security professionals can easily know the organizations responsible for any IP ranges thereby providing a stepping stone in their investigation.